I used to call this section ‘Feeling the Beat/Pulse and off Beat’ and I used to then have another section called threes against twos but they are now important parts of the same section ‘The Rhythm Tree’ which is just about the only part of music which I learnt at school and still teach. In our lessons we will see how this chart above can help us understand the rhythms we are playing. How all the rhythms are related to one another, how to feel and identify the constant pulselbeat underlying the music, how to play one rhythm over another, how to improvise, how to play on the beat, how to play off the beat and how to move freely from one feeling to another. One of our main objectives is to feel the rhythms we are playing, so often when people are playing music we are trying to work thinks out and then we have got it we want move to the next thing, never taking the rhythms into our bodies and getting to the stage where we don’t have to think about what we are playing but just feel and enjoy it. For some of us it can take a life time but what we need to do is bypass our brains and connect with the feelings and they give us. A good way of doing this is playing rhythms for sometime. 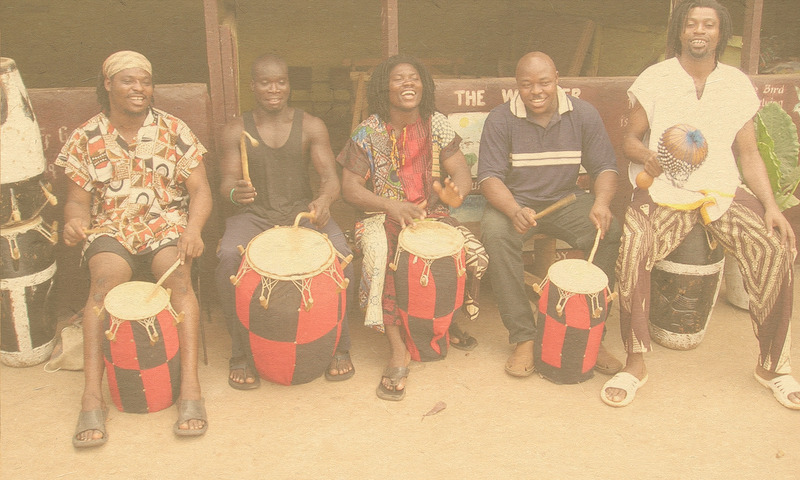 When I learn from my teachers in West Africa I may often be left for one hour just playing the same thing so that when I come to play it again I don’t have to think it through, instead the rhythm comes to me from within , I have internalised it. Inside all the music i play there is a beat, a pulse, a driving regally repeating force. Its what i feel inside when i play, its the dancers feat, the songs phrasing and the poetry’s meter. Its the foundation upon which play, the structure upon which every rhythm you play sits. In Africa its not talked of discussed, but its built in to the culture the childrens stories and games the pounding of the food the speeking of the language.